A friendly paw tap to all of my pawsome human friends. Today I have exciting news. I am part of an event that seeks to help spread random acts of kindness. It’s called the Giver Games. I am in realm seven, and I am proud to say that I am the only feline playing against a bunch of humans. The way the Giver Games works is that each day, there is a theme that we focus on. Once we find out what the theme is, we find a way to do a random act of kindness around that theme. Yesterday, the theme was DRAW. Now, I’m smarter than the average cat, and with my extra toes, I can hold a paint brush or pen. But use it? I’m afraid I can’t do that. And when I turned to my human for help, he told me that I was silly. Draw, he said? You know I can’t do that, Bagheera. But I am not a cat that gives up easily, and I wanted to do something today to participate in the Giver Games. So I thought about what I’ve been able to do. I’ve been able to bring attention to special needs cats or cats with other needs like me. And I’ve got pictures of them. So what I did is put together a montage of four cats that I have written about. And I thought that I should make my human donate money to help with one of them whose human doesn’t have a lot. And that’s what I did. 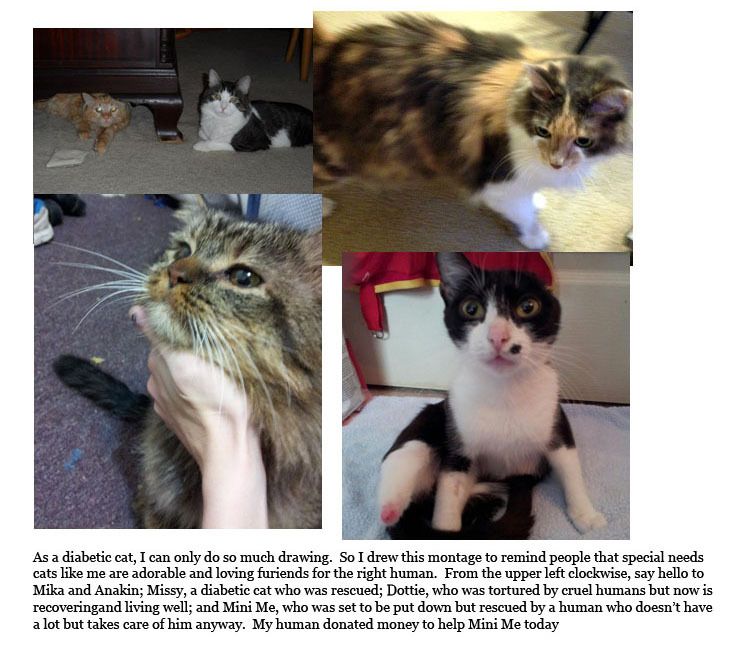 What do you think of this montage of cats I’ve been able to help because of you wonderful humans? Not to bad for a polydactyl diabetic cat, huh? I will share the theme of the day with you later. Once I do, please see if you can practice a random act of kindness around that theme and post your picture to my Facebook wall. Then I can share it, and we can see how many people like it. I hope you humans do some wonderful things to spread some kindness in the world and share it with us!